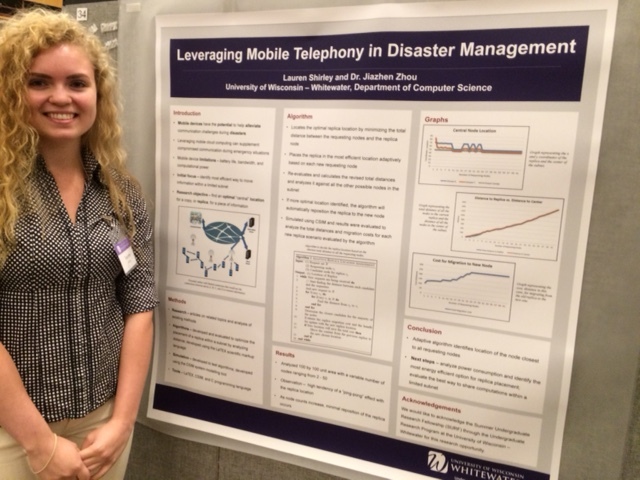 Lauren presented research on Leveraging Mobile Telephony in Disaster Management at the 9/27/16 UW-W Undergraduate Research Day. Click on photo to view album. 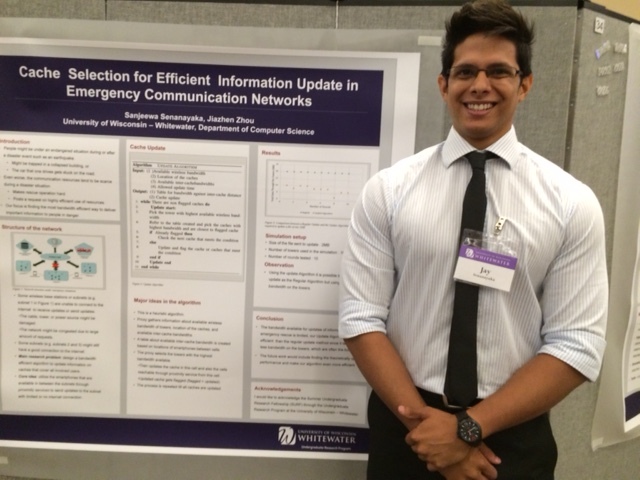 Jay presented his research on Cache Selection for Efficient Information Update in Emergency Communication Networks at the 9/27/16 UW-W Undergraduate Research Day. Nyia Lor received a UW-W SURF award for 2015 and was invited to present at Posters on the Rotunda in 2016. 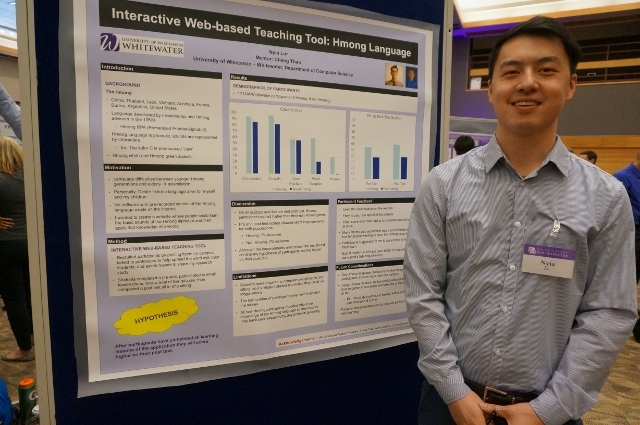 He is pictured above, presenting his research, “Hmong Language Teaching Tool”; at Undergraduate Research Day 2016. He has submitted an abstract to the 2017 Hmong National Development Conference. Three papers accepted or being reviewed at conferences/journals this year. Click photo to view album. Neural Networks and Topic Modeling for Sentimental Analysis (Albert/Kirkeby; faculty mentor Nguyen). 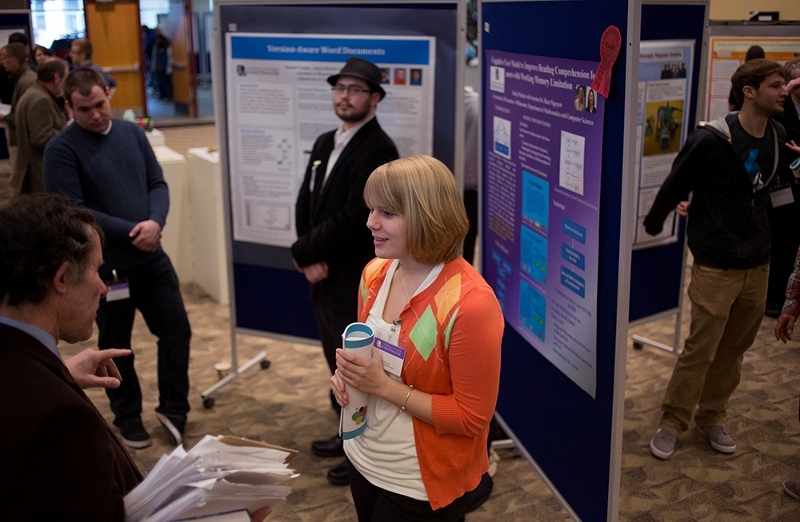 Undergraduate Research Day, March 19, 2014. 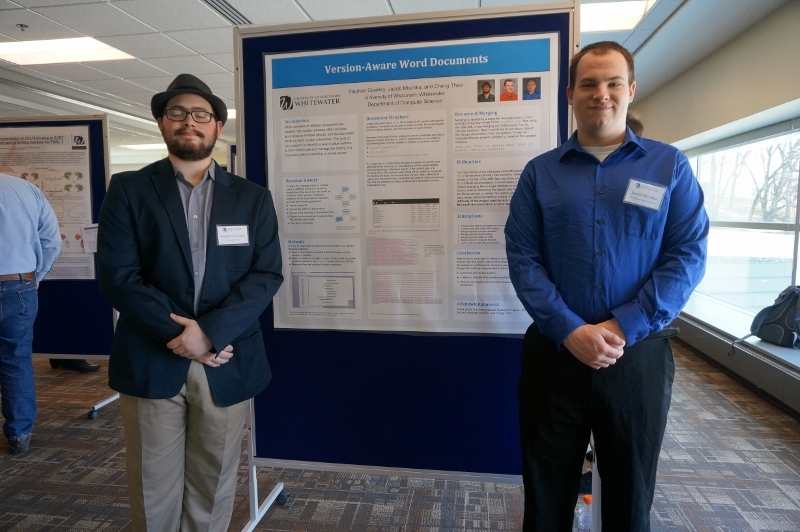 Two computer science research posters made it to the finals. The poster Emily Paulson submitted (above) for her work with professor Hien Nguyen, won in its category. 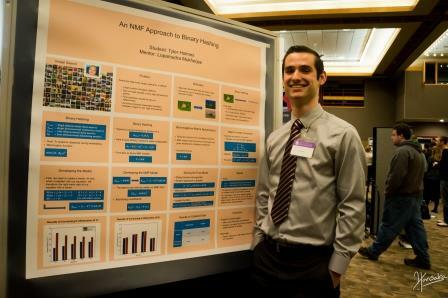 Received first place poster award for the Math/Physics/Computer Science category at UW-Whitewater Undergraduate Research Day 3/18/15. Paper was presented at ACM Symposium on Document Engineering in Colorado, USA, September, 2014. Presentation at IEEE National Conference in Hawaii, Spring 2015. Students: LQ McDonald, Lucas Greenwald. Faculty advisor: Catherine Chan, Hien Nguyen. Develop and implement a framework that enhances analyst effectiveness, supports active collaboration among analysts, and assists in the training of junior analysts by capturing user intent in the analytic process. Integrate this framework with other on-going projects in CASE program. Students: Jacob Russell, Adam Olson. Students: Nathan Smith, Jacob Russell. Faculty advisor: Bennette Harris, Hien Nguyen, and Mr. Jim Harris. We developed software that simulates errors that occur in an Ethernet networking environment at the packet level. We evaluate our approach quantitatively by measuring the elapsed time of an application running in a network with and without simulated defects. In addition to the extended abstracts submitted to National Conference on Undergraduate Research, students also submit papers to International, national workshops, conferences and journals. Here are some typical examples. Evaluation of the Impact of User-Cognitive Styles on Assessment of Text Summarization. 2011 Hien Nguyen, Eugene Santos Jr., Russell Jacob . IEEE Transactions on Systems, Man and Cybernetics Part A. Volume PP(99), pages 1 – 14. Capturing User Intent for Analytic Process. 2009. Eugene, Santos. Jr., Hien Nguyen, John Wilkinson, Fei Yu, Deqing Li, Keumjoo Kim, Jacob Russell, and Adam Olson . In Proceedings of User Modeling, Adaptation, and Personalization (UMAP 09) , 349-354, Trento, Italy. Hybrid User Model for Information Retrieval. 2006. Hien Nguyen, Eugene Santos Jr., Aaron Schuet, and Nathan Smith. In Technical Report of Modeling Others from Observations workshop at AAAI-2006 conference.